Have you ever found yourself driving behind a semi-trailer truck? If you’re on a single-lane highway or road, it can be a nightmare. Even though the truck is driving relatively slowly, you cannot overtake it due to its size, and because you cannot see what is happening in front of the truck. However, Samsung has developed a solution that may make this problem a thing of the past. Argentina’s statistics on traffic accidents are among the highest in the world, with most of these accidents occurring on two-lane roads and particularly in situations of overtaking. 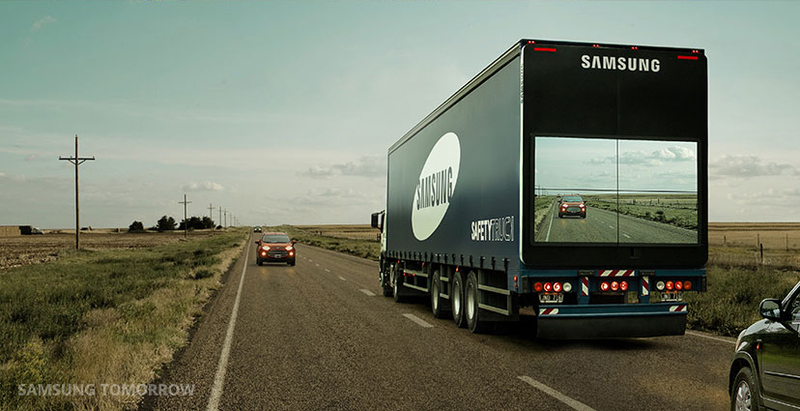 With this in mind, Samsung developed a technology for trucks that seeks to enrich the lives of people through innovation. But more than that, this time the goal is more ambitious: to save lives. The Safety Truck consists of a wireless camera attached to the front of the truck, which is connected to a video wall made out of four exterior monitors located on the back of the truck. The monitors give drivers behind the truck a view of what is going on ahead, even in the dark of night. This allows drivers to have a better view when deciding whether it is safe to overtake. Another advantage of the Safety Truck is that it may reduce the risk of accidents caused by sudden braking or animals crossing the road. Currently, the prototype truck built is no longer operational. So far Samsung has been able to confirm that the technology works and that this idea can definitely save the lives of many people. The next step is to perform the corresponding tests in order to comply with the existing national protocols and obtain the necessary permits and approvals. For this, Samsung is working together with safe driving NGOs and the government.